Your 2014 Birthday Reading will be ready later on today -- and this is your last chance to purchase for $24.95. After we publish, the price will go up to $39.95. In your reading, Eric covers the unusual Mercury retrograde that is about to happen in Gemini, the highly unusual grouping of planets that's working its way across your relationship angle, and what it could possibly mean to have the planet Chaos in your sign. He'll also go over the influence of the grand cross, and focus on Uranus square Pluto and the impressive influence of Chiron and Neptune on your career. He has also recorded a free audio preview of your reading. 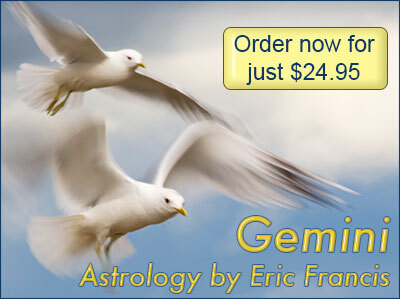 The full Gemini Birthday Reading consists of two astrology segments (approximately 20 minutes in length), a tarot segment using the Voyager Tarot by James Wanless, photos of the charts and tarot spread, an extended sign description and access to last year's reading to check Eric's accuracy. Remember, by pre-ordering your birthday reading now, you'll save $15 off the published price.